All useful hashtags if you're looking for an update or to take part in a thread with fellow fans. Not so good if you're innocently scrolling your timeline to suddenly see a spoiler by someone who, clearly, has no heart. 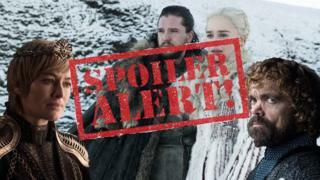 Given that the final season of Game of Thrones is here, you'll need some essential tips to help you avoid spoilers - and stop you falling out with people for life. It might sound obvious but, until you're caught up, a 24-hour social media detox might be the only way to go. Remember: there's always someone who likes to show off that they've watched that episode before you. WhatsApp groups need to be muted, Instagram Stories need to be shelved - and you better be hovering over that mute button for Twitter. It's a powerful tool. It's possible to block specific words, phrases, usernames, emojis and hashtags on Twitter. You can also mute people's Instagram posts, and even stories, if they're bad. Bottom line - if they can't be trusted, unfollow or even block them. You don't need them in your life. While some outlets like to give warnings, some don't. Frankly, it's a minefield out there. Be sure to swerve that morning paper, favourite entertainment site or news bulletin if you're in any doubt. Image caption "Nothing to see here"
OK so you couldn't avoid the news but at least the article you've clicked on has a clear warning. The comments underneath didn't though - and now your day is ruined. If you use Firefox or Google Chrome, using CommentBlocker is an effective way of shutting out the noise. And Chrome also has a Spoiler Shield which stops your feed telling you who's not made it to the end of the episode when you wake up. If you don't think any of the above will work for you, then it's time to go back to basics. Not by necessarily smashing your devices with a hammer, but by temporarily swapping them with say yoga, Spanish classes or jogging. Sounds drastic, but locking yourself in your room might be the only way to keep you from finding out what happened to Jon Snow. If you do find yourself in a situation where you have to speak to someone, ground rules need to be established early. It might sound obvious, but watching a show where people watch telly is a sure way to ruin the outcome of your favourite show. If you can't miss it, be prepared to fast-forward as soon as you hear that theme tune.